The Big Feed is an event held between Christmas and New Year�s each year. Hundreds of volunteers show up at Way of the Cross, help prepare and get orientated the first day and evening, and go out as groups the next morning into Mexican villages or colonias (city neighborhoods) and do outreaches. On the final day they all assemble at a field in Matamoros where they put on games, hand out gifts and prizes and feed chicken and beans to the thousands of people who show up. Big Feed 2007 was on December 27, 28 and 29th. There were sixteen teams ranging in size from a dozen to 75 people. Each team had its identifying color. That color was on the van signage, the neck lanyards that team members used to hold their name badges and on the team flag. Juanita and I were assigned to the Brown Team. The WOTC staff member leading the team was Isaiah and the rest of the team was made up of about 22 members of Southwest Community Church, Olathe, Kansas. This was their first time at a Big Feed as was it ours. Isaiah had done them before, but it was his first as a leader. I drove one of the two vans and Isaiah drove the other. That made us �designated drivers�. Everybody else was a �designated pusher� There had been no rain to speak of for all of December, so �designated pusher� did not have much significance. At times when there is rain there is also mud. Designated pusher becomes a much more vital role. Also a wetter, muddier one. The Brown Team arrived midday on the 26th after riding in a chartered bus overnight from near Kansas City. They arrived at the warehouse downtown and helped pack gift bags and then they came out to the training center for supper, orientation and sleep in a dormitory setting. They seemed a little tired when we met up with them at orientation and not much less so the next morning. 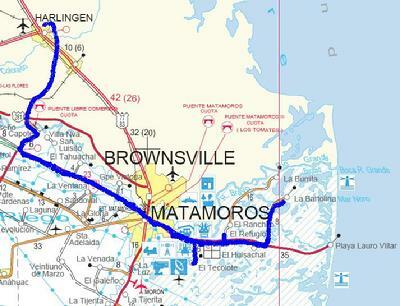 We crossed the border at the Free Trade Bridge and drove the highway parallel to the border into Matamoros. This was the group�s first introduction to Mexican roads. They may have been tired, but they were no longer sleepy. This highway is one of the better ones, but it is still of type with two lanes and two almost wide enough shoulders so that you can in a pinch get four abreast traffic so the slower vehicles don�t slow things down too much. Slower being a relative term rather than an absolute term, usually. We met up with a pastor at a convenience store and did an outreach in El Tecolote, a colonia on the edge of Matamoros. It was fascinating to watch the team become engaged as they were called upon to speak and participate and they saw the people and their circumstances and their response. At the end of the outreach people representing any area churches were called up and they invited the people who had made decisions to attend if it was close to their home. Then we went further out from Matamoros into the agricultural land north of the road to Playa Bagdad and towards the Rio Bravo (called the Rio Grande if you are standing on the North shore). This is singularly inhospitable land. One has to feel for the people scratching out a living from it. One weekend Juanita and I drove out through the equivalent land on the American side and ran across a sign telling of a Civil War era army post that had been located on a small strip of higher ground there. If memory serves me well something like 5,000 out of the 8,000 troops perished just sitting there while the bugs, germs, heat and sundry diseases worked on them. Spanish sailors who were shipwrecked seldom made it through this area to make it back to New Spain (Mexico). Of course, they had the Indians to contend with as well. It is said that nowadays the drug lords have a say in what happens in that area. But despite the history and my jaundiced view of the place the inhabitants turned out in large numbers to hear the group and most responded favorably. We dropped the pastor off at his humble dwelling in a colonia in Matamoros. He definitely must be called of God to serve in those conditions, especially after having lived for years (legally) in the US. 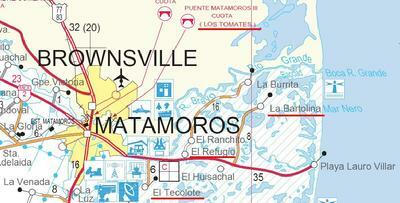 Then it was back across the Los Tomates crossing in Matamoros and back to the training center for supper. Up early the next day with all our vans lined up in a row again and headed to the border crossing into Matammoros at Brownsville. Before crossing we stopped, got out of the vans and buses and all circled up and prayed. After crossing we all drove to a meeting point at a Pemex station. When everyone arrived we convoyed the circuitous route through several colonias to our destination � a soccer field sized vacant lot. When the lead van makes a wrong turn everyone follows and then everyone does a three point turn to get going the other way. Would like to see an aerial shot of this. A couple of teams had gone in early to set up so by the time we arrived the chicken was already cooking. About six thousand pounds were cooked over the course of the Big Feed. There are a number of different locations of service on the field. These include tending various booths with games, face painting, balloon animals, etc. or cooking chicken, or the booth where people pick up their strip tickets for the various raffles held during the day. Prizes can include sewing machines, bicycles, soccer balls, a car (running, but not new), and a completed house (one room about 12 feet by 20 feet on a flat-deck trailer ready to move to the winner�s lot) The day is tightly scheduled. Each team has a binder with a schedule of where they were to be when. Our team started by flipping chicken which was being cooked on expanded metal mesh held above burning charcoal with concrete blocks. Then we moved to a booth that handed out balloon animals. It would have helped if any of us knew what we were doing, but the kids seemed happy enough to get a balloon twisted into a head dress. We could have used the clown from Tampico. At one point we ran out of balloons for a while due to a bit of a fumble on the hand-off from the previous team - but somebody scrambled to one of the game booths and the kids got plush animals for a while. Note to self - In reviewing some pictures from 2006 I notice that a team that year pre-built a bunch of balloon animals and filled garbage bags with them. While we were at that booth one old woman with a walker asked for prayer and then walked on her own. I lost track of her after that, but heard from somebody else that she was last seen walking away from the site carrying her walker. There were two flat deck semi-trailers, one at each end of the field. Each had a sound system. While all the other activity was going on some staff would get up on one of the flat decks and announce a raffle. A crowd would gather. There�d be some singing, some preaching, a call for a decision, then the winning ticket would be pulled out and announced. Then the same thing would happen at the other end of the field as the crowd moved back and forth and amidst all the other attractions. After turns at the registration booth and the prayer area our team ended up flipping chicken again and then it was time to help hand out chicken and beans (the beans are cooked in washtubs over open fires and stirred with a boat oar) and one gallon zip lock gift bags. The bags have a string handle so they can be hung on the kids� shoulders. The people typically just fold the paper plate like a tortilla to hold the chicken and they carry the cup of beans in their other hand. Much more efficient than trying to balance a piece of chicken on a flimsy paper plate. Then it was time to clean up the site a bit and head for the border in a convoy. We were entertained by the van ahead of us. It held an inveterate shopper. We watched as various plaster animals and a rather large pi�ata made their way in through the windows as the van stopped at intersections. Once we made it across the bridge into the States and stopped at customs the passengers got out of the vehicles and went through on foot. We drivers stayed with the vehicles. A number of the teenagers in the busses behind us rushed ahead and created a bit of a traffic jam. Particularly the few that had failed to bring the appropriate identification. Since our group was leaving to head back to Kansas as soon as we got back to the training center, Juanita got permission from the other pople in line to let them go first. Then it was back to the training center to get them fed and on their way. Then Juanita helped dish out supper to the other groups while I swamped out the Brown team vans and said goodbye to a few departing staff members. The Big Feed marks a transition point in the life of the Way of the Cross ministry. Each year, a few people are inspired by their experience to come on staff. Some stay for years. Also, however, each year people who have been vital parts of the ministry use the Big Feed as their last duty before moving on to other pursuits. The couple we traveled to Aldama with had learned a number of ministry skills in their four years at WOTC and were moving on to a work in Africa. They had officially left at the beginning of December but returned to help out on one last Big Feed. Two other single staff members concluded their WOTC service that night and were on the road to Tennessee and Missouri respectively within hours. Another couple went back to language school up the valley about fifty miles from here. It would be hard to serve and work so closely with so many people and then see them go.